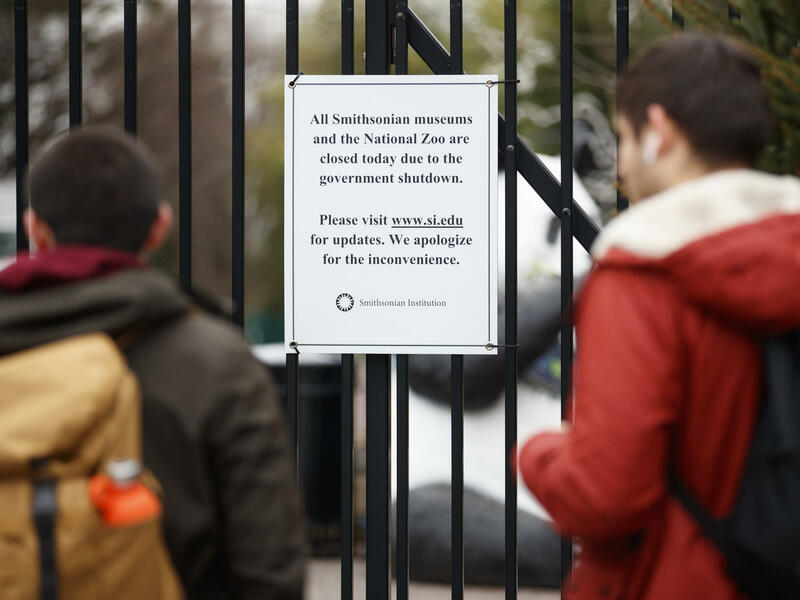 A sign posted outside the National Zoo earlier this month declares its closure, along with the closure of all Smithsonian museums. They were all on the wish list for Jill Rorem, whose family plans were undone by the shutdown. But she's not alone: The shutdown's ramifications on the arts have been felt far beyond the Beltway. Jill Rorem, like many Americans, had made some special plans for the holidays. The Chicago native, whose legal work often brings her to Washington, D.C., was finally going to get to see the nation's capital with her arts-obsessed kids. "I have very nerdy daughters, and they're super cool. Like, my oldest kid was Andy Warhol for Halloween," Rorem says. So they'd planned a grand tour of the city's museums, from the National Gallery of Art to the Smithsonian's National Portrait Gallery, maybe even the zoo if she could convince her husband. "They would have soaked it up. I always love watching things from my kids' eyes." Then, the federal government partially shut down. Instead of heading to D.C., where all their dream destinations were shuttered without funding, her family lost about a thousand dollars rescheduling the trip. Now, Rorem readily concedes that her family's frustrations are far from the worst of the shutdown's fallout — but she's also far from alone. The showdown in Washington has reverberated across a vast expanse of the U.S. arts community and beyond the country's borders. It has been felt not just by the museums and their patrons, but also by Brooklyn students, Los Angeles filmmakers, domestic nonprofits and foreign artists — even among the volcanoes of Hawaii. "It's a fragile industry. It's not a rich, money-making thing," Robert Lynch, head of Americans for the Arts, says of the landscape of arts workers and organizations. "So any little crack — whether it is the elimination of money from the National Endowment for the Arts or the slowing of it down, like a shutdown does — it potentially affects people and their planning and their ability to attract other funders, all of that kind of thing. It's a ripple effect." There are about 100,000 nonprofit arts organizations across the country, according to Lynch, and when it comes to funding, "many of them end the year just on the edge." So the NEA and its sister agency, the National Endowment for the Humanities, often represent a critical boon to many of these groups. Both agencies reach thousands of small and large organizations around the country, including NPR. And getting a grant from the NEA or NEH helps those groups to raise funds from other sources, in turn. On its website, the NEA says it will honor all of its Fiscal Year 2019 grants and that it's accepting applications for 2020, but during the shutdown there's nobody working at either agency to answer questions. This has left many of the groups that rely on them feeling stymied and skittish. "Because federal grants are done on a reimbursement basis, we don't have the money in hand," says Dorothy Ryan, managing director of Theatre for a New Audience, a theater company based in Brooklyn. 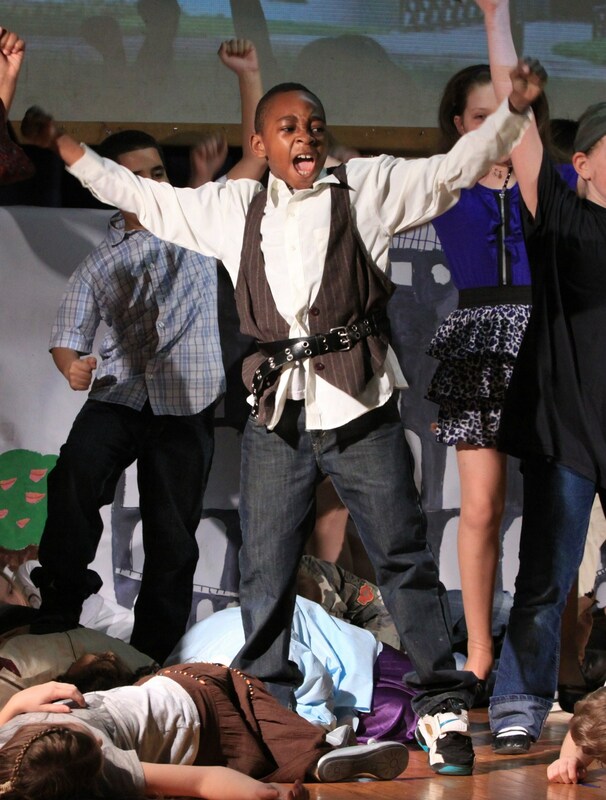 Fifth-grade students perform in a production of Shakespeare's Cymbeline, as part of Theatre for a New Audience's World Theatre Project. Dorothy Ryan, the Brooklyn-based organization's managing director, worries about what the shutdown will do to their funding. For more than a decade they've been taking Shakespeare to some of New York's poorest schools through a program partly funded by the NEA. This spring they're planning to introduce students to Shakespeare's Julius Caesar, and though they've been awarded a $25,000 grant from the NEA, Ryan worries about when they'll actually receive it. "As you can imagine, any nonprofit cultural organization struggles with cash flow, as they really need to expend funds before funds are received," she says. "And the question about when the National Endowment for the Arts will be distributing funds really hits home for us." It has also hit home thousands of miles away in Hawaii, where Glenn McClure is feeling the pain of the shutdown in quite another way. The composer, who draws his musical ideas from nature, received a $2,000 stipend and housing from the National Parks Art Foundation to produce work inspired by the Volcanoes National Park on the Big Island. So McClure is facing a double whammy: Not only is the source of his funding affected by the shutdown, so is his temporary workplace. Since the shutdown shuttered the park, he has had to cancel a scheduled concert and lecture, and he can't get into the park to carry on his research. Such concerns are not confined to Hawaii either. On the mainland, the closure of federal lands has also barred filmmakers from using some popular shooting locations, such as the Angeles National Forest near Los Angeles. The region's official film office, FilmLA, says it has already had to redirect about half a dozen prospective productions because of it. That doesn't just cause headaches for the filmmakers; it costs local authorities thousands of dollars in permit fees and potentially discourages other projects in the area. "California and Los Angeles have worked very hard to return the film industry back to the region after years of poaching by states and countries that have offered money for the industry to leave," says FilmLA President Paul Audley. "Every time we have a situation where the industry has to look elsewhere, it can become habitual to go away. And so our concern is that over a duration of time that this could have an impact on the level of production in our region." The National Parks Arts Foundation is not the only group to have an artist-in-residence program. 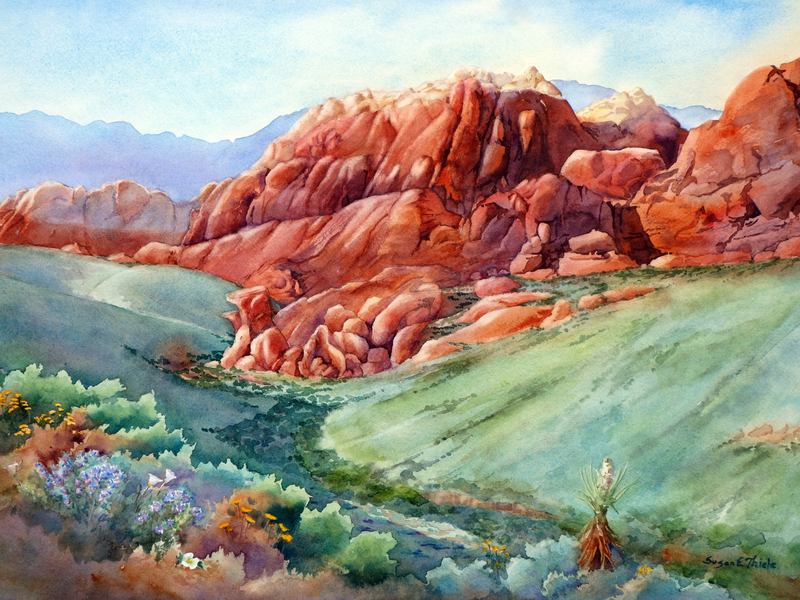 The federal Bureau of Land Management also has a program — and it has produced works like this one, Susan Thiele's "Calico Springtime," painted in Red Rock Canyon, Nev.
"What we do, when do we pull the plug?" Complexity and frustration is nothing new to Brian Goldstein. The entertainment attorney with Goldstein & Guilliams has spent some two decades navigating the often Byzantine twists and turns of the U.S. visa process for his firm's international clients, mostly in classical, jazz and world music. "People, I think, just assume the arts show up," he explains. "And I don't really think they know what's happening to get these things — you know, domestically, let alone when it involves international performances." But he says the shutdown has only compounded those complications. "We already have the venues calling our office every day: 'What's going to happen? What we do, when do we pull the plug?' " Goldstein says. "And I have nothing to tell them, because everybody is just hour-by-hour, minute-by-minute on hold." For now, visa and passport services remain open, according to a State Department spokesperson, "as long as there are sufficient fees to support operations." Still, he says such assurances have offered cold comfort to his clients and the venues booking them, who fear the prospect of delayed operations derailing their headline acts weeks and months down the road. "You know, it's show business — it's already fraught with risk and danger," Goldstein says. "And this is one more complete unpredictable process that could blow up at any moment." Of course, the shutdown also complicated matters for Jill Rorem, the mother who rescheduled her family trip to Washington, D.C. And though she did go ahead and book new tickets for the trip in April, she's careful to say that doesn't mean she's making any predictions. "Honestly, who knows if the shutdown will still be there," she says. "But we decided that the cherry blossoms would be there, and we could at least walk around comfortably outside." Glenn McClure, the composer working in Hawaii, is seeking solace in nature, too — albeit in a slightly different way. "It's frustrating to not be able to do work at the level that I had anticipated," McClure says. "But I think above and beyond that, it's so important for these parks to be open, because it helps teach everyone how important the natural world is to our human life on the planet." The partial government shutdown is making more people anxious every day, including those in the arts. Theaters, dance companies, symphony orchestras, nonprofit arts organizations worry about the impact on themselves and their audiences, including school kids and families. NPR's Elizabeth Blair has more. ELIZABETH BLAIR, BYLINE: Dorothy Ryan is managing director of Theatre for a New Audience, based in Brooklyn. For more than a decade, they've been taking Shakespeare to dozens of New York's poorest schools through a program partly funded by a federal agency, the National Endowment for the Arts. This spring, they're planning to introduce students to Shakespeare's "Julius Caesar." DOROTHY RYAN: They start by learning the story of the play and learning how to understand and read Shakespeare. And then they come to see the play in special morning matinees that we do. BLAIR: But Ryan's concerned now that the NEA is closed during the shutdown. Theater for a New Audience has already been awarded a $25,000 grant from the NEA. But here's the thing. They don't get the money until after services have been delivered. RYAN: We don't have the money in hand. As you can imagine, any nonprofit cultural organization struggles with cash flow if they really need to expend funds before funds are received. And the question about when the National Endowment for the Arts will be distributing funds is - it really hits home for us. BLAIR: On its website, the NEA says, despite the shutdown, it will honor all of its fiscal year 2019 grants and that it's still accepting applications for 2020. But there's nobody working at either the NEA or the humanities endowment to answer questions. Both agencies give money to thousands of small and large arts and cultural organizations across the country, including NPR. Getting a grant from the NEA or NEH helps them raise funds from other sources. But fundraising is a delicate, time-consuming process. Bob Lynch is head of the advocacy organization Americans for the Arts, which also contributes to NPR. ROBERT LYNCH: It's a fragile industry too. It's not a rich, moneymaking thing. So any little crack potentially affects people and their planning and their ability to attract other funders - all of that kind of thing. It's a ripple effect. BLAIR: Visits from international artists could also be in jeopardy. BRIAN GOLDSTEIN: You know, it's show business. It's already fraught with risk. And this is one more complete unpredictable process that could blow up at any moment. BLAIR: Brian Goldstein is a lawyer with GG Arts Law, a firm that helps international artists secure visas to perform in the United States, mostly in classical, jazz and world music. Goldstein worries a slowdown in an already complex process will make American venues nervous about programming foreign artists altogether. GOLDSTEIN: We already have the venues calling our office every day. What's going to happen? What do we do? When do we pull the plug? RYAN: For now, visa and passport services remain open. According to a State Department spokesperson, they'll stay open, quote, "as long as there are sufficient fees to support operations." Art lovers have had to cancel trips to those free museums and galleries that are federally funded. That includes "The Art Of Burning Man," a blockbuster show at the Smithsonian's Renwick Gallery and a show of works by photographer Gordon Parks at the National Gallery of Art. Both are closed during the shutdown. Jill Rorem and her family spent months planning a trip to Washington, D.C., from their home in Chicago during her daughter's winter break. JILL ROREM: We decided not to go after the shutdown because we didn't need to travel and spend all that money on hotel rooms and fancy meals if we weren't going to get the cultural and educational aspect of it. BLAIR: Rorem says they lost about $1,000 rescheduling their trip to D.C. for April. She's optimistic the shutdown will be over by then. If not, she hopes they'll at least get to see the cherry blossoms. Elizabeth Blair, NPR News, Washington. (SOUNDBITE OF MEAN LADY SONG "I WILL MARRY YOU") Transcript provided by NPR, Copyright NPR.